Although we produce some standard aircraft, it is often the case that a particular application needs something slightly different. 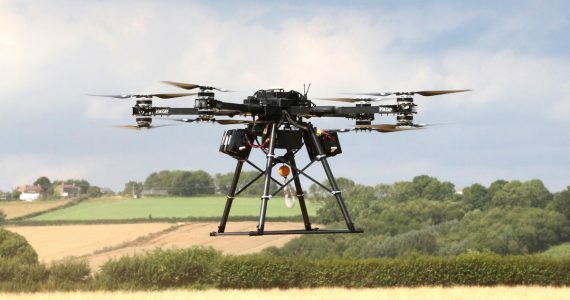 There is often a need to find a machine that can operate within quite specific operational parameters, in unusual ways or very particular circumstances and, with the number of ways these aircraft might be used increasing constantly, this is far from uncommon. Currently the vast majority of our work involves some kind of system customisation. This may be something as simple as specifying a particular set of components to optimise performance, but can often involve more. Making changes to an airframe to enable the use of different sensors, fit unusual antennas, attach non-standard payloads, integrate power systems for payloads, customise landing gear, or customised functionality are commonplace. In some cases an entirely bespoke aircraft specifically designed for the particular application may be the only solution. 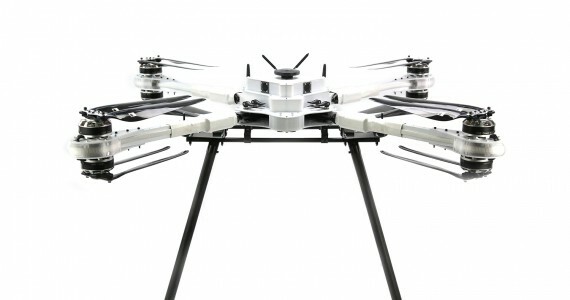 With our long history of building unusual VTOL flying machines, and our ability to manufacture many parts either in house or through our carefully chosen manufacturing partners, we are able to work with our customers to produce bespoke or customised systems that most closely fulfil their specific requirements. Please feel free to get in touch if you would like to discuss your project, we are happy to sign an NDA if required and you may be surprised how inexpensive a custom solution could be. This waterproof Harrier 7 variant is fitted with a high power jet wash with custom built remotely operated robotic arm. Designed to operate at up to 20m above take off point (to cover tidal variation) this aircraft is used to clean the guano from access landers on the new breed of ultra large wind turbines in the North Sea. Located over 100 miles off shore, these turbines provide the only place to land for sea birds for miles and so attract them in huge numbers. The resulting guano presents a significant health and safety risk to engineers working on the structures and has to be removed prior to access. Operating from a crew vessel in what can only be described as very harsh conditions this aircraft is highly resistant to wind, rain and spray, and with it’s high pressure cleaning payload enables safe access without risk to engineers who would otherwise have to call in a specialist crew to clean the structure. The aircraft had to be structured to fit entirely behind and within the screens themselves causing some interesting aerodynamic effects, and well as the difficulty of managing the considerable weight outside the diameter of the props. 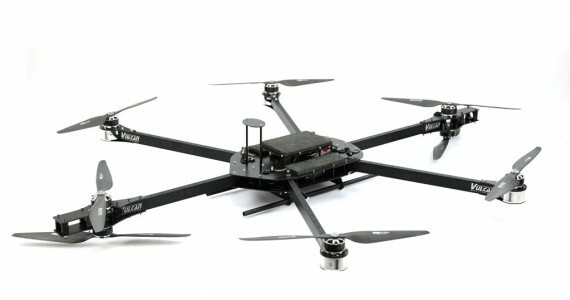 They also have to be flown accurately and in close proximity in a turbulent air environment, and so use both lasers and optical flow for position and height control. An interesting challenge. On top of this the aircraft were designed to be stacked and fitted together to make one large screen then flown off one at a time! The D7 and D8 are designed for simple delivery applications. 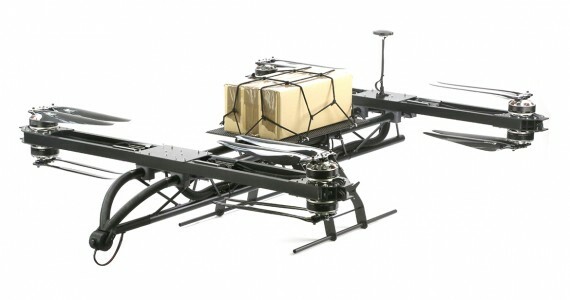 The item to be delivered is placed on top of the aircraft to avoid the difficulties of getting packages into and out from the underside of the aircraft. The anti slip matt and tough elasticated cargo net prevent the item moving during flight, and make for simple and quick removal on arrival. The D7 is capable of a payload up to 10 Kgs, and D8 option would increase this to 20 Kgs. This variant of the Airlift was designed specifically for one of our large offshore energy industry clients. 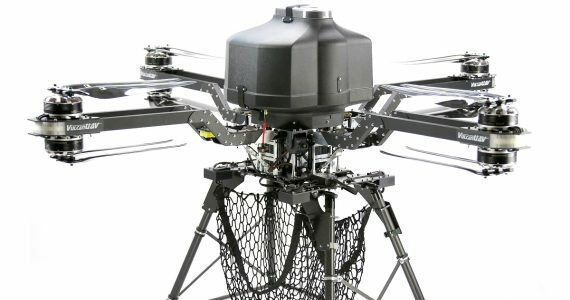 It will carry a payload up to 25 Kgs and features a remote payload release system to allow the pilot to fly from support ship to the heli pad on an oil rig, release the payload and leave without anyone needing to approach the aircraft. 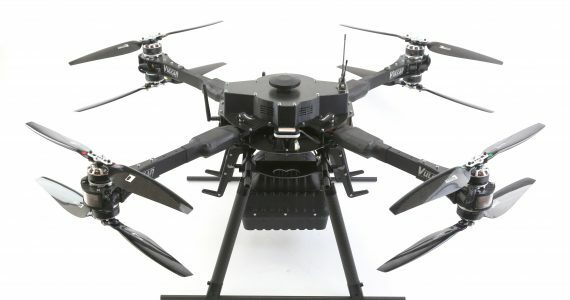 This aircraft is fully weather resistant, has a custom one axis FPV camera gimbal and range sensor for remote landing assistance and can be folded for transportation. As the name implies GPR is used to look for information about what is beneath the ground with applications ranging from archeology to mine detection. Normally GPR would be fitted to a small ground vehicle or even dragged across the ground by a human operator, however this approach is not always practical or in some cases even possible. GPR sensors rely on close proximity to the ground, so to undertake this from a UAV requires operation at very low level and at a very consistent altitude. A grid pattern using waypoints is generated and altitude is maintained using a very accurate laser altimeter and some clever terrain following algorithms. This Raven variant was designed to carry an extremely sensitive RF spectrum monitoring system. Traditionally such systems are bulky and heavy but Metis Aerospace developed a system light enough to be flown by one of our aircraft. With a payload as sensitive and high value as this, low vibration levels, excellent resilience in difficult conditions, ultimate reliability, quick deployment and ease of use are all key. The system itself is designed to pop up anywhere at very short notice and monitor activity across the full range of RF frequencies. We cannot disclose exactly how wide a range or number of frequencies it can monitor simultaneously, but it is a very impressive piece of kit! 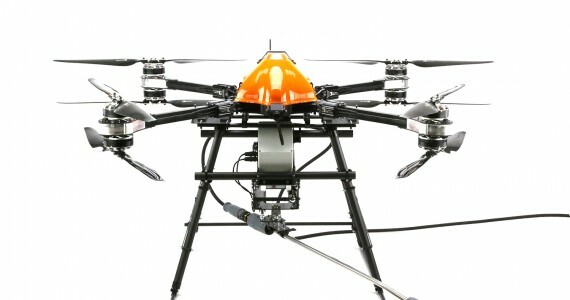 The UAV smart winch developed by us for delivery of light payloads to areas where landing is not possible (such as the top of wind turbines), or for placing of equipment or sensors in hard to reach or no access locations (with the addition of our remotely operated dropping hook – not shown here). The smart winch is integrated into one of our removable quick release landing gear systems for quick swapping of different payloads for different functions. The winch is almost entirely automated as it must be able to operate well away from clear view of the pilot operator. A downward facing camera is fitted, and the winch is able to monitor it’s position at all times enabling the operator to have no worries about deployment height or correct retraction. A simple three positon switch is all that is needed to operate all winch functions. A number of safety systems are included such as overload protection, signal loss, positional override reset and even an emergency escape procedure in case the winch line were to get tangled or hooked to something on the ground. Unfortunately we cannot discuss the payload or application for this particular aircraft, or the reasons behind why it was developed. However the Hex8 is a truly unique aircraft configuration which offers the redundancy offered by 8 motors, with the improved efficiency of having only two pairs of co axial motors. The machine also maintains the benefits gained by co axial aircraft in handling difficult weather conditions.The Hex 8 folds neatly into a compact form factor for transportation.